As odd as this might sound, I'm getting a lot of 'Tarzan' posters for my PVR programme listings. Shuffling quickly down the quide, all of these items appear to be isolated to programmes with 'New:' before the title. I think I'm using the default characters to strip from title (\*|,|(|)|:|;|\&quot;|`|_new|new_|.|\&apos . but still not picking up the poster art when I know some items definatly exist. Even tried removing the default items to strip from title and using just 'New' but still nothing. Not even getting my fallback poster artwork. Any suggestions on what might be causing this behaviour? Does anyone encounter a problem with fetching artist info, thumb, banner etc.? Also, when entering the info window the right banner of Chicago is being replaced with a default banner. as you see in the next screen shot the correct banner is faded out and replaced by the default banner. Since it's a very long log look at line 12460 and further on. (2017-06-10, 10:56)Dave.B Wrote: [ -> ] Does anyone encounter a problem with fetching artist info, thumb, banner etc.? @Angelinas, Thank you so much for your reply. Can you please elaborate on that? what exactly I need to change in order to avoid this error? in dialog out of list can.....that is basic of code in script.helper. You can use replecable code for webservice in list Art. 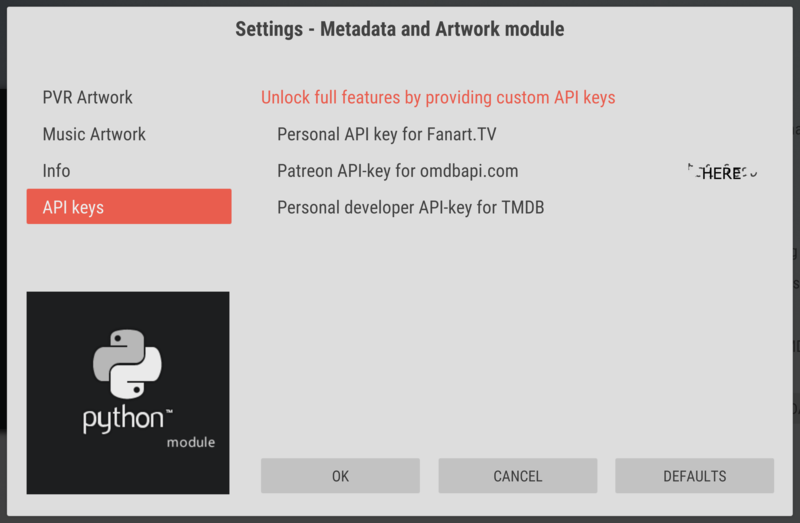 I have got my API key by becoming a patron. Now how and where do I use this api? Please tell me. what if i don't have any music in my kodi? can this be done following different steps? Can I grab these reviews with the help of my omdn api ? Here's what I did step by step. 1st, I became a patron by subscribing to Basic subscription and received my API key. But still SkinHelper.ListItem.Rating.MC/SkinHelper.ListItem.MetaCritic.Rating and NOTHING of rotten tomatoes are working. What else do I have to do to get them to work?